Xoar PJP-T-L Carbon Fiber Precision Pair Multicopter Propellers is the latest to the Precision Pair family which offers ultra thin hub to further reduce weight to maximize efficiency of Low Kv Motors for your Quadcopter or multicopter aerial application and multi-axial model helicopters. The concept of PJP-T Carbon Fiber Precision Pair Quadcopter Propellers was based on Carbon Fiber's two major advantages: weight and strength in order to provide the most accurate and responsive performance. 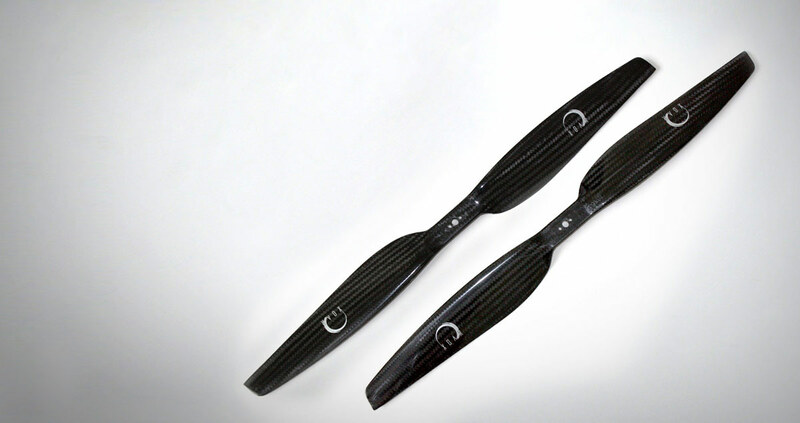 The Carbon Fiber series of Xoar Quadcopter Precision Pair is produced with unique blade shape and ultra thin hub. The pairs have the same pitch, same angle of attack, and same weight in order to create accurate, responsive and stable performance. We have tight quality assurance when pairing each precision pair because propeller weight is the most important factor in multi-rotor applications. The maximum tolerance in terms of weight difference for each prop in precision pair is as little as 1 gram; this will guarantee consistent performance due to same torque being produced by the motors on each pair of opposite arms. Therefore, ONLY the best Xoar Carbon Fiber Props tested with great static, dynamic equilibrium are selected and packaged as Xoar's Carbon Fiber Precision Pair for RC Quadcopters and Multicopters. Xoar's Carbon Fiber Propeller for Low Kv RC Motors are constructed to offer maximum strength and endurance by it's unique structural design, top quality 3K carbon fiber fabric, and our special resin system. The superior strength reduces flexing of the tips in Drone flight which greatly lower noise and vibration. Xoar keeps pushing the envelop in innovation and has successfully reduced weight on Carbon fiber props by ~37% compared to the first generation; we produce one of the lightest yet strong propellers in the marketing today. In addition, Xoar PJP-T-L Carbon Fiber Quadcopter Propellers are compatible with any electric brushless motors in the market like, Hacker Motor, T-motor, DJI, KDE, etc. Xoar can drill the Propeller Mount Pattern based on your motor design. Xoar drills the carbon fiber with only the best drill bits to make sure the accurate measurements for secure mount. Xoar props maximize your quadcopter motor's efficiency because vibration is minimized due to Carbon Fiber's stiffness and light-weight; a light Xoar Carbon Fiber prop with high flex resistance yields less amplitude vibrations due to less kinetic energy and consumes less time to speed up and slow down. In addition, Xoar's perfect airfoil reduces aerodynamic resistance and yields better thrust to maximize your motor's efficiency. Due to Carbon Fiber's stiffness and Xoar's unique blade design, aerodynamic resistance was minimized to help the motors to draw less current and yield longer flight time by increasing efficiency. Flight time is extended up to 15% when compared to wood multicopter propellers and up to 30% when compared to generic plastic props. In order to reach the balance of light weight and stiffness, Xoar introduce unique the structural design of the multi-rotor propellers: from diameter 12 to 18", the shape of the hub is flat; from diameter 19" and up, hub is round in order to ensure structural strength. Xoar Precision Pair is also available in beechwood.